President Trump meets the Chinese Leader in Beijing to a special welcome catering to Trumps ego. Despite all the tough rhetoric and hard line language that president Trump used during his election campaign and in the first year of his presidency, Trump has changed his tune towards China, as he lands in Beijing to start trade talks with Chinese President Xi Jinping. He doesn’t blame China anymore, he blames America, stay with me here, Yes! President Trump blames previous American administrations for the problems the two countries have had with China. The President’s praise of China for its trading practices came amid a morning of intense diplomacy on the second day of his visit to Beijing. Whilst they were huddled in intense talks whilst in Tienanmen square. 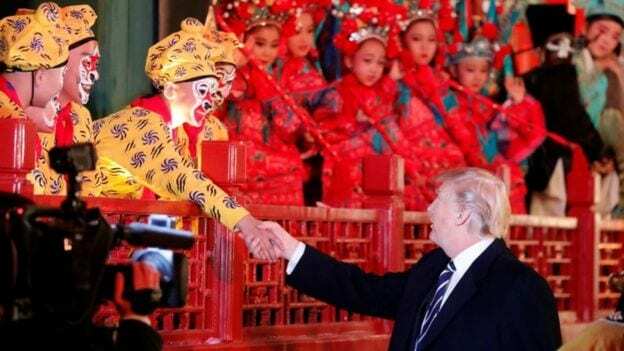 In Beijing, President Trump and Chinese President Xi Jinping made small talk as they toured the Forbidden City – which was shut down to tourists – with their wives before taking in a Chinese opera performance. It was a shift in tone, that the world has witnessed, from a Republican President who was elected to office partly for his tough talk on holding other countries accountable for practices that disadvantage US workers. Trump sought to bolster his image as a hard-nosed negotiator, announcing $250 billion (£190bn)in agreements between US companies and China, which now sounds more like a handout from china than a sensationally negotiated trade deal. It is also worth noting many of those deals have been in the works long before Trump was elected. Trump will address his country’s deficit with the world’s second-largest economy. Before his departure, Trump described the trade deficit with China as “through the roof” saying it was “so big and bad that it’s embarrassing saying what the number is”. The US trade deficit for goods totaled $347bn (£264 bn) last year. China also holds about one-third of the US’ global debt. The US and other countries have frequently accused China of unfair trade practices, such as high import tariffs that have put Chinese companies at an advantage. A lot of these advantages are unfairly levied at China as it is still classed as an emerging economy and has more relaxed carbon and trade tariffs, that all ’emerging economies benefit from. To manage this situation China often agrees to trade deals individually with countries and on climate change targets. In some instances China also takes the lead, for instance with it nationwide Electric car targets. The details are sketchy at best yet but however the deal transpires the U.S is going to imitate China’s targets for zero emissions and electric cars. Another key element of the state visit to China is the ongoing North Korea situation, which China is seen as key to resolving. The two men sought to put forward a united front on North Korea, which has been a persistent area of focus for Trump during his 13-day tour through Asia. The outlandish welcomes Trump receives are becoming popular for foreign leaders, who are eager to appeal to Trump’s own sense of importance. The art of diplomacy is not lost with the Chinese and underpinning Xi’s displays are a flex of Chinese power as he positions his country as an economic rival to the United States. Some might wonder in this meeting; that the world’s first and second most powerful men have met in Beijing. But which one is which! ?